Time for a new spin! At your blog, before next Monday, Monday 22, create a post to list your choice of any twenty books that remain “to be read” on your Classics Club list. TO SEE WHICH BOOK I HAVE TO READ SOON. This entry was posted in Classics and tagged Arthur C. Clarke, Italo Calvino, Stanislas Lem, Stefan Zweig, William Faulkner by WordsAndPeace. Bookmark the permalink. I really enjoyed We. It’s fast paced and I was a little shocked by what Zamyatin had imagined in th early 20’s. He was definitely ahead of his time. Thanks for your comment. I would love to have that #! funny! we’ll see if 8 and 15 make any difference in the draw!! But I actually dread both!! Oh, so many good ones! I loved To The Lighthouse. The Castle of Otranto I laughed my way through but I’m not sure if that was the hoped for effect, lol! Have a great spin and enjoy all the snow I see on Instagram! Now, this Otranto effect is intriguing! Snow in April is definitely NOT fun to me, well, it never is anyway, but even less now. I’ve found Faulkner almost impossible to read! John Steinbeck is really good, though. The Baron In The Trees is one of my all-time favorite books, so in a way I’m hoping you get that. But I followed Brona’s example & put my Woolf book (The Waves) in slot 8, so that would be fun, too. It looks like a very fun list. I love Italo Calvino, but haven’t read that one yet, yes, I want it! Travels with Charley is just wonderful, it was my first Steinbeck and I’ve loved nearly all of his other novels so far. North and South is also excellent, and Xingu is HILARIOUS — Edith Wharton wrote so many great stories! Good luck with your spin pick! oh wow, I had never associated Xingu and hilarious in my mind, good to know! Great list! I have read many of them. any special one you wish me to get this time? What a great list! I didn’t put The Sound and the Fury on mine, but I can’t wait to read it. (I really liked As I Lay Dying.) North and South is one of my favorite books, and Castle of Otranto was such a fun, quick read, so both would make good spin reads. I hope you get one you love! good to know that Castle of Otranto is fun and quick! Some familiar titles but many I don’t know at all! Every time I read someone’s CC Spin list, I start adding titles to my TBR. LOL! Hope you get a book you enjoy. You have so many god ones 🙂 I loved The Baron in the Trees and Love in the Time of Cholera – so, I hope you get those! I enjoy a lot Italo Calvino, but haven’t raed that one yet, so yes it would be nice! Thank you so much for this. Your blog always inspires me. 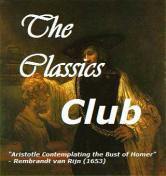 I love classics and read them constantly, From your list I have read #s 2, 8, 9, 12, and 19, all worthwile reads. So, I really had to join your challenge because while I read many classic books all year long, I feel there are never enough. I have read four classics this year but they are all more than a hundred years old, three more are older than fifty yeras. Hope it’ll be 15 or 16 for you. I really love both of those books.